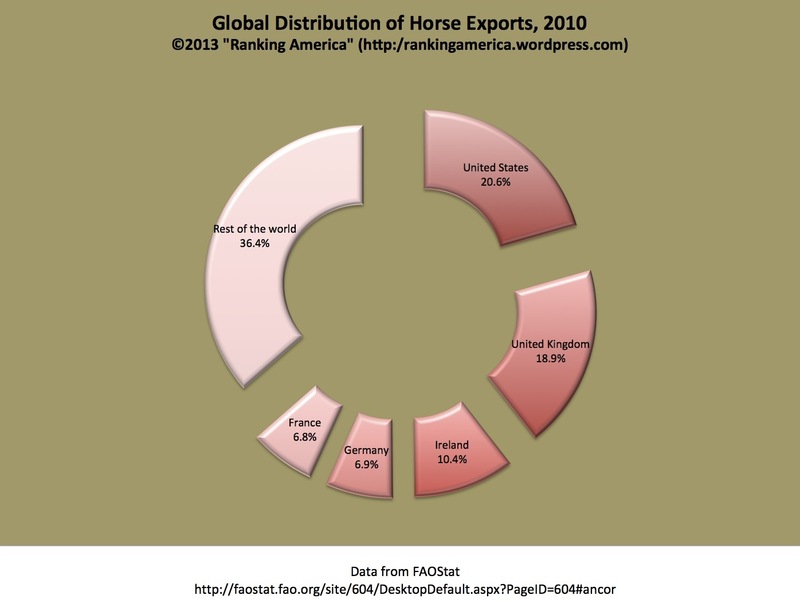 According to the Food and Agricultural Organization of the United Nations, in 2010 the United States exported $414,788,000 worth of horses, or 20.6% of the world’s total value of horse exports. That is enough to make the United States rank first in that category. According to the Small Arms Survey, in 2008 the United States exported $715,000,000 worth of small arms and light weapons. That was enough to make the United States rank first out of thirty-seven weapons-exporting countries ranked in that category. 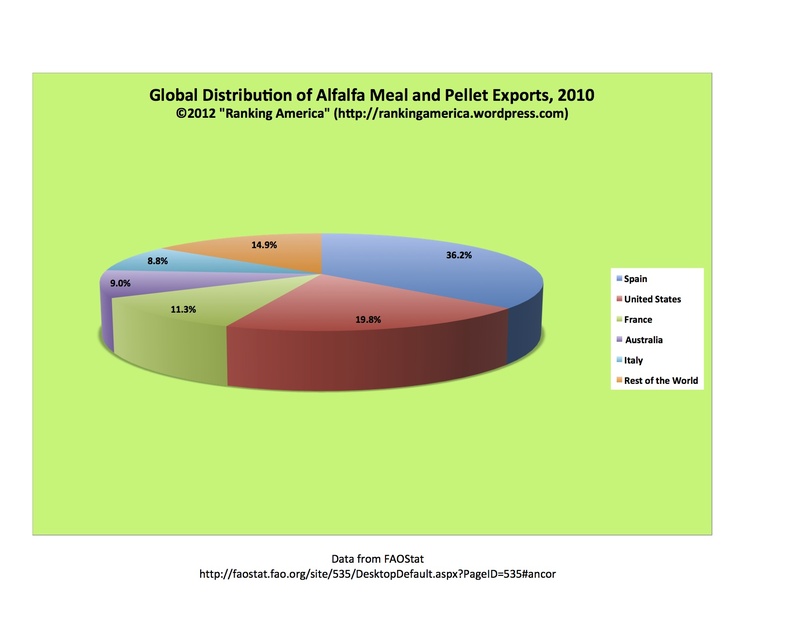 According to the Food and Agricultural Organization of the United Nations, in 2010 the United States exported 258,983 metric tonnes of alfalfa meal and pellets, or 19.8% of the world’s exports of that item. That was enough to make the United States rank second out of eighty-six countries ranked in that category. 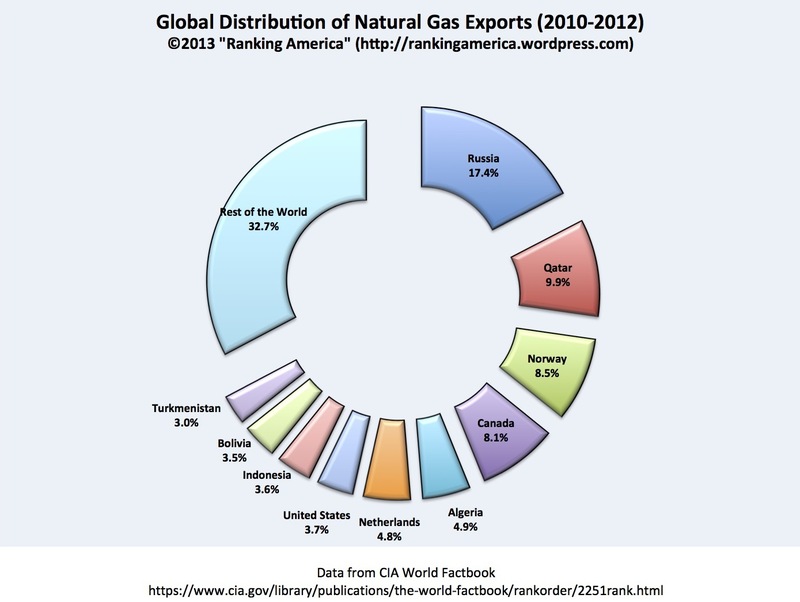 Spain ranked first, exporting 473,004 tonnes, or 36.2% of the world’s exports. 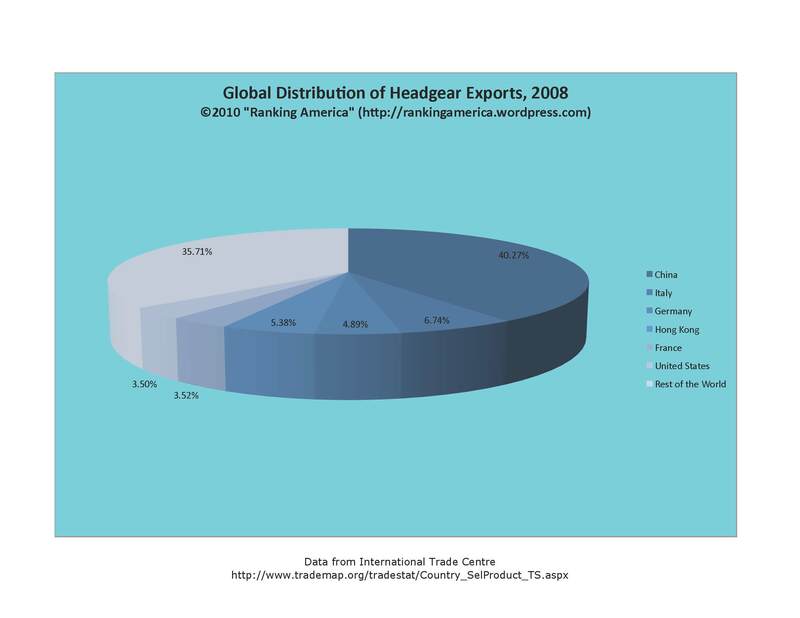 According to the International Trade Centre, in 2008 the United States exported $207,096,000 worth of headgear, or 3.50% of the world’s total “headgear and parts thereof” exports for that year. That was enough to make the United States rank sixth in that category. 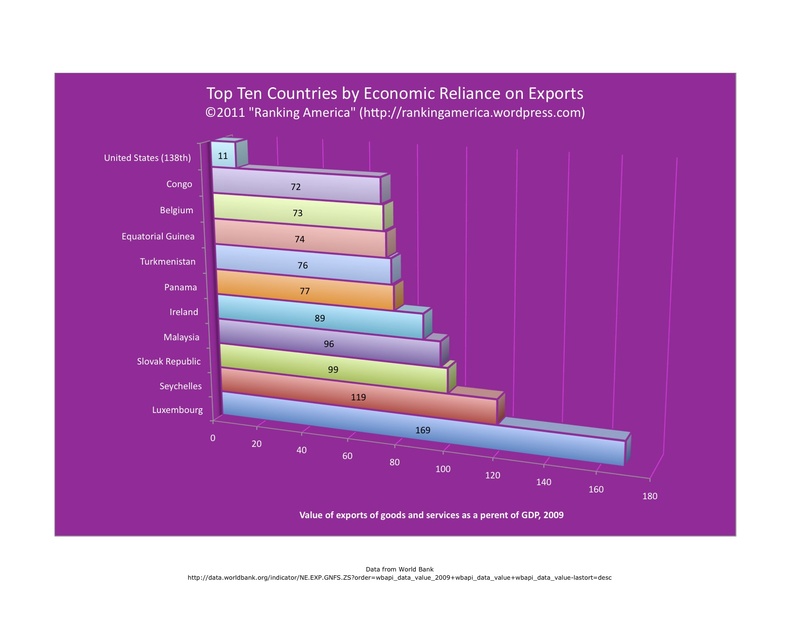 China ranked first, exporting $2,385,698,000 worth, or 40.27% of the world total. 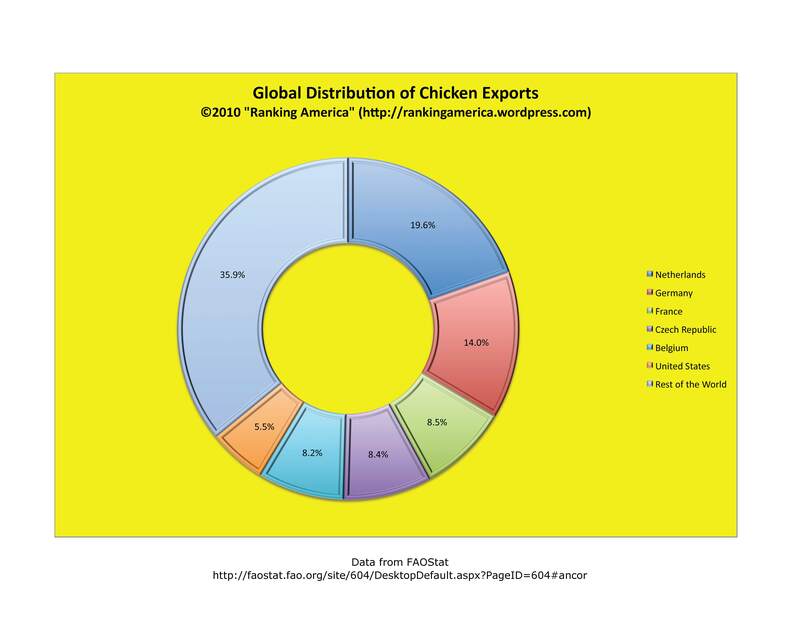 According to the Food and Agricultural Organization of the United Nations, in 2007 the U.S. exported 51,828,000 chickens, or 5.5% of the world’s total chicken exports. That was enough to make the United States rank sixth out of eighty-nine chicken-exporting countries. The Netherlands ranked first, exporting 185,234,000 chickens, or 19.6% of the world total.